In an industry dominated by homogeneity, Sunniva defies convention. 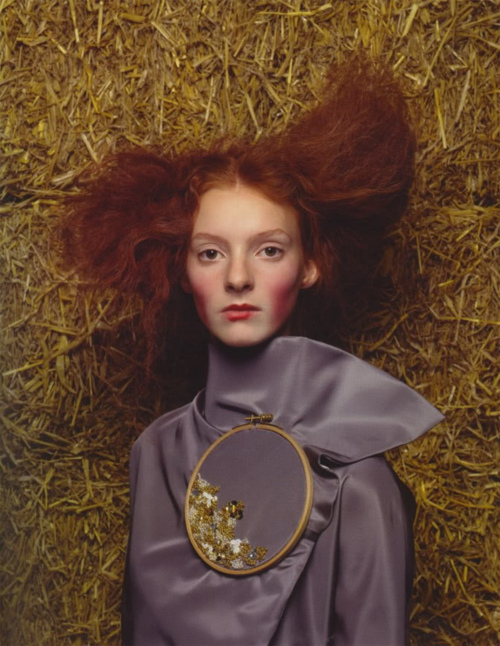 With her shock of red hair and Nordic features, Sunniva rode the wave of unusual beauties in the late 90’s and redefined what it meant to be beautiful. After fronting campaigns for Versace, Akris, Anna Sui and gracing the cover of numerous magazines, Sunniva left the modeling industry to pursue a master’s degree in molecular biology, laying to rest the notion that models are one-dimensional. Sunniva spoke candidly to me and Emily Sandberg about the moment that changed her career forever, motherhood and what she considers her greatest achievement so far. How did working with Steven Meisel change your modeling career? I was a classic case of being a Meisel girl. I started modeling in Paris during my summer vacation before my last year in high school. My first job was the Chanel couture show. My agency convinced me to give modeling a chance but I was hard to convince as I was set on finishing school, but they did it somehow. In the end I’m glad they did. I finished high school while studying back stage at the shows. I packed my bags and left Oslo, Norway for Paris. I was there about two days when I kept receiving messages that there was a photographer in New York called Steven Meis-something-or-other who was interested in meeting me. I was clueless about who he was and what a great influence he had on the industry, but I could tell from the people around me that it was a big deal. I was really excited when I was booked to shoot the CK campaign with a group of girls in New York and then I did a 30 page single-girl story for Vogue Italia following that. Just a few months after I left Norway I was on the cover of Vogue Italia; that opportunity made my career. I worked with Steven on a regular basis which was important for me as a model. I have an editorial look and Steven’s support was amazing, not to mention how fun it was working with him. You left modeling to pursue your master’s degree in molecular biology, why did you want to reenter the fashion industry? I left modeling after four years. I needed a break and I always thought I would go to university so the timing felt right. Once I was home I didn’t look back, I really thought I had quit for good. I did my master’s degree in molecular biology, got married, and had a daughter in 2006. A year later my husband had the opportunity to pursue his music career in New York and I was all for it. When we moved back I missed the city more than I missed fashion. I took a break from my doctorate thesis but I wasn’t quite ready to be just a wife and mother. I thought I would look around and see if there were opportunities or inroads back into fashion since I was going to be in New York anyway. I met a great booker through someone who managed my career previously and we clicked immediately. I was back in the proverbial saddle. How has motherhood informed your life and the choices you make? It’s such a cliché, but it changed everything. I reentered the fashion world when my daughter was nearly two and it was really tough spending time away from her. After a while I didn’t feel that the effort was worth it. It was fun, and it still is, but I really wanted to get back on track with my science degree. I also had another daughter two years ago which made modeling less manageable. I am happy for my experiences as a model, but I want to be good role model to my two girls. I want to show them that they can do what they set their mind to. I have started my doctorate in breast cancer genetics which is really exciting. It is important to me as a person, and as a mother, to be in control of my own life and my own decisions. As a model you are very much a result of other people’s opinions. In an industry dominated by a very narrow beauty ideal, how do you think your look has influenced tastes? I definitely think I was in the right place at the right time. The late 90’s was a place for girls that were defined by a different kind of beauty. I think it was great for the fashion industry and I think that mentality is still relevant today. Despite there being uniformity to the look of the season, the industry is open to something out of the ordinary, which I think is great! There is still room for more diversity such as ethnicity, size and age. I think if industry leaders wanted they could make fashion reflect more of the real world. Personally, I think that would make it more interesting. Do you feel more or less pressure now to maintain a certain weight than you did at the beginning of your career? Honestly, as much as I hate admitting it, I do. As a 17-year-old girl with a background in gymnastics I was aware of the weight issue when I started modeling. I let everyone in my agencies know that if they mentioned weight to me, I would go home on the spot. That might have been a reason why my career started slowing down. I left before it got really slow, I’m not a patient person and I had other things I wanted to do with my life. When I was around 20 my hips were getting wider and I would hear on castings that they were too big. Reentering the fashion world after an eight year break and having a baby I was pragmatic and realistic. I knew I would have to lose weight and probably struggle to keep it low enough to be of any real interest to clients. I am pretty sure the sample sizes and models in general have become substantially smaller since I was last in the game. Now I am trying to be a good mother, serve healthy foods to my girls and I need a little more food to be able to use my brain at work everyday. I am aware that I am not a working model size. It bothers me some days, but most days not. Marc Jacobs used two 14-year-old models in his Fall 2012 RTW show. How do you feel about the increasing use of younger and thinner models in the industry? I don’t think it’s a great trend. The industry argues that girls stay in school and are accompanied by chaperones, which is really hard take it from me, and I was 17. My experience and opinion is that it’s a tough industry and job. If you are not surrounded with people who have only your interest in mind, it is a tough place for a 14-year-old. The job is based on your looks alone, not who you really are, and that can be especially tough when your self-esteem is still developing. That said, it might work out just fine for some girls, but what’s the rush? Girls still look young when they are 17 or 18. What have you learned about yourself from your time working as a model? I learned so much at different stages of my career. When I moved to New York at 17 I learned to take care of myself, pay my rent, gas bill, travel e.t.c.. I felt so independent, which I am sure every 17-year-old that moves out feels. It’s hard to summarize the lessons I have learned, as this took place during such an influential time of my life, but I have learned that the only one I can trust to make decisions for me is myself. I learned to be around a lot of very different people and really enjoyed the part of modeling that took place in front of the camera; it was my domain. I also learned some lessons the tough way. One season I was an “it-girl” and the next the same people would not even acknowledge me. It was pretty tough but it taught me that I want to be a good person and treat everyone I meet with respect. However, I wouldn’t have it any other way. Perhaps that I was able to be fully caught up in the fashion industry, and make it out safe and sound. I was able to enjoy the thrill of modeling but also be able to move on to other things that are truly the most valuable to me now: my children, husband, and my new job as a student. What went through your mind when you were first scouted? It was such a strange day. I was walking home from school in my hometown,Oslo, when a woman with 20 shopping bags approached me. I was sure she needed help carrying all her stuff. She came straight up to me and asked me if I had ever considered modeling. I literally started laughing. I was 15 and a full head taller than any of my friends, so I was slouching trying to fit in. I had my hair brushed out, it took me years to figure out that brushing did not help mange my frizzy, curly hair, had braces, and was generally not the coolest kid in school. It’s not a unique story. She left me her business card and the number of an agency called Heartbreak. The name did not help but despite that they are still my mother agency today. I was curious and ended up in their archives. Two years later something was in the air because three different scouts picked me out from the archives which included about 2000 girls, hands, and snakes. I had the option to go to Milan, Paris or London for the summer. I chose Paris. What would you say to your younger self knowing what you do now? Stick with the people who believe in you. Personal relationships and friendships are the most valuable. Probably the biggest mistake I ever made in modeling was leaving the booker I loved and shared so much with because of what other people were saying. All in all, I am really happy things turned out the way they did and I have reunited with my friend.